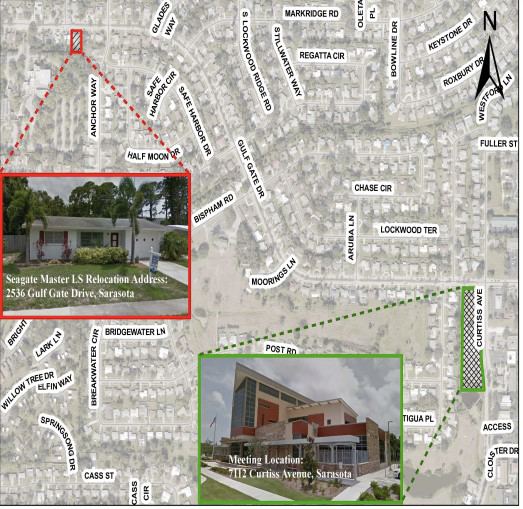 Sarasota County is hosting an open-house style public meeting for property owners along a portion of Gulf Gate Drive and the surrounding area to provide information and gather input regarding the relocation of an existing lift station at Gulf Gate Drive and Seagate Avenue. On January 29, 2019, the Sarasota County Board of County Commissioners approved the purchase of a home at 2536 Gulf Gate Drive. The home is planned to be demolished and a new lift station constructed on the property in the future. Once complete, the existing lift station located within the road median at Gulf Gate Drive and Seagate Avenue will be removed. The project is in the initial planning phase, with design and construction to be completed within the next 4-7 years as part of the Capital Improvement Program. The purpose of this meeting is to provide information to the neighboring property owners. Additional neighborhood meetings will be planned during the design of the lift station to gather input regarding possible aesthetic improvements, such as fencing or landscaping. County staff will be available to speak with interested citizens, one-on-one, to answer any questions you may have.